US Citizenship & Immigration Services (USCIS) has urgent news for some recipients of Deferred Action for Childhood Arrivals (DACA). A February 16, 2015 court order in Texas v. United States specified that USCIS should continue to approve DACA deferred action requests and related employment authorization documents (EAD) for two-year periods, notwithstanding President Obama’s executive actions of November 20. After Obama’s announcement, USCIS had been issuing certain DACA renewals and EAD cards for the three years specified under the Obama executive action. After the February 16, 2015, court injunction was in place, USCIS mistakenly issued approximately 2,100 EAD cards for a three-year period rather than the allowed two-year period. USCIS has therefore updated their records to reflect a two-year period of deferred action and employment authorization for these affected individuals and has re-issued and mailed out the corrected two-year EADs. USCIS has also notified these individuals that the three-year EADs are no longer valid and must be immediately returned, along with any related approval notices, to their local USCIS office. USCIS is tracking the number of returns of these invalid EADs and continues to take aggressive steps to collect the remaining cards. Who can keep their 3-year EAD work cards? USCIS has a helpful guide for DACA recipients. After President Obama’s executive actions regarding immigration reform on November 20 last year, USCIS began to issue three-year EAD cards. The approximately 108,000 three-year EAD cards that were approved and mailed by USCIS after November 20 and received by DACA recipients before the February 16, 2015, injunction date (and that have never been returned or reissued by USCIS) do not need to be returned to USCIS. Individuals who are required to return three-year EADs and have not done so will be contacted by USCIS by phone or in-person. USCIS reports that they also may visit the homes of those individuals who have not yet returned their invalid three-year EAD or responded to USCIS's request that they return the cards. USCIS will reportedly attempt to call the individual in advance of any home visit and USCIS employees will always show the individuals their credentials during any visits. Those recipients who have not been contacted by USCIS and have received a three-year card after February 16, 2015, should use the new online tool or call the USCIS Customer Service line at 1-800-375-5283 to verify whether they are affected before returning the card. What are the consequences of not returning card? 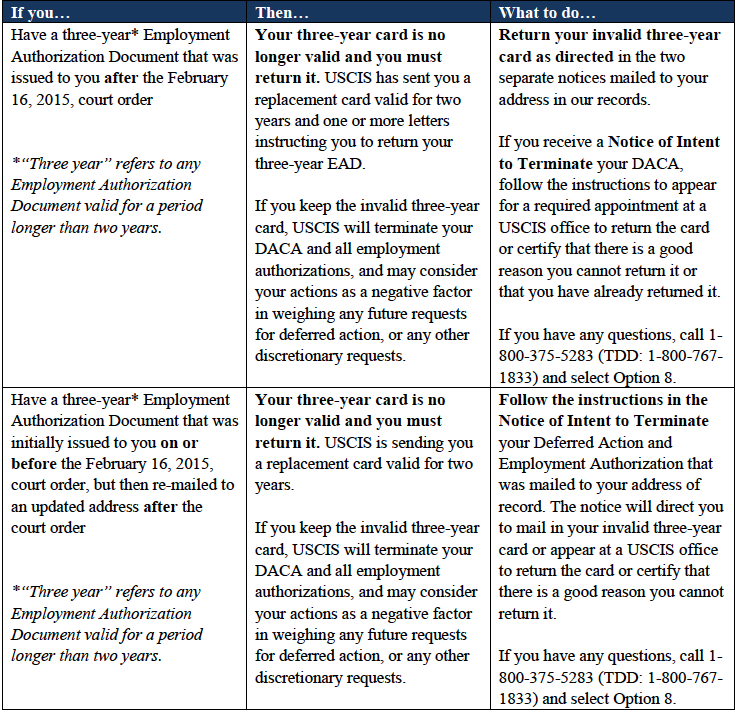 For those recipients who are required to and fail to return the card, USCIS will terminate DACA and all employment authorizations effective July 31, 2015. Since the consequences of not returning the card is severe, DACA recipients should note carefully if they are required to return their card and speak to an experienced immigration attorney if they have questions.